It has been suggested that I write about a typical day in my job as Village President. I have been mulling this over for some time now, because truthfully, no day in this job is typical. Many of my activities are exactly what you would expect: attending meetings, interacting with staff and county officials, dealing with resident complaints. But this past December, I had a day in which I was reminded three times over of the very best part of my job. Meeting with residents one-on-one, getting to know them, and working together with them to solve problems or implement new ideas is what I truly love. Whether old or young or in-between, our residents never fail to inspire me, to remind me of the reasons to persevere, and to give me hope for the future. My day started out by paying a visit to one of my favorite long-time residents, Barbara Turner. 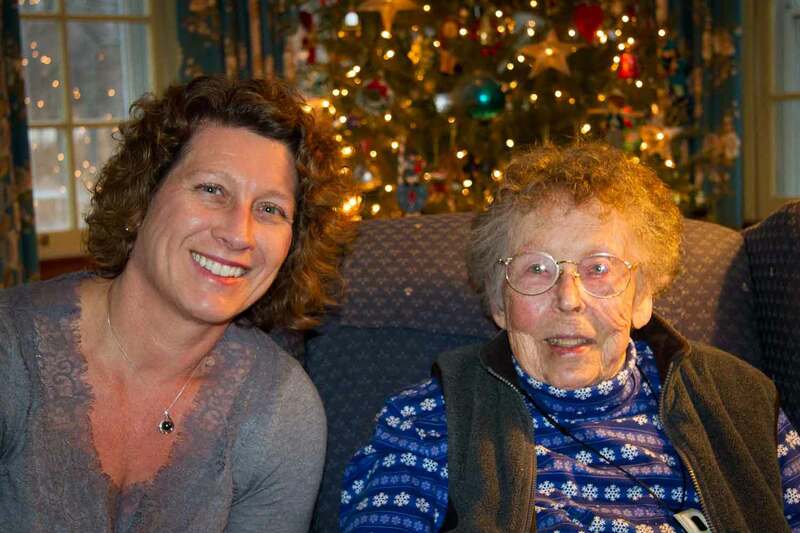 Barbara is familiar to most of us as the namesake of Reed-Turner Woodland, and the force behind the ongoing stewardship of this treasure, as part of the Long Grove Park District. Over coffee and cookies, I had a chance to learn a little bit more about Barbara’s background, and her thoughts on some current challenges. In addition to her environmental work, Barbara has always been interested in history and books. She has a Bachelor’s degree in Art History, and a Masters in Library Science from Rosary College in River Forest. For her independent project to qualify for her Masters, Barbara did a multi-media study in Long Grove history, parts of which were incorporated into the book “Long Grove Lore and Legend,” which she co-wrote with Virginia Park. Barbara worked for many years as a librarian at Kildeer School, and served as the curator of the Long Grove Historical Society along with Dorie Hoyne. Our conversation also included some of the recent changes in Long Grove, and those coming in the near future. Barbara has been mindful of the upcoming widening planned for the downtown crossroads, and is grateful that none of the historic buildings will be lost on this “unique country corner.” Her love for the character of our Village is apparent. Even though Barbara is in her 90’s now, she still makes it a priority to keep up with current events in Long Grove, and mentioned to me that she misses not being able to attend Village Board meetings as she had in the past. I, for one, can say that Barbara is always present, as an inspiration to me. 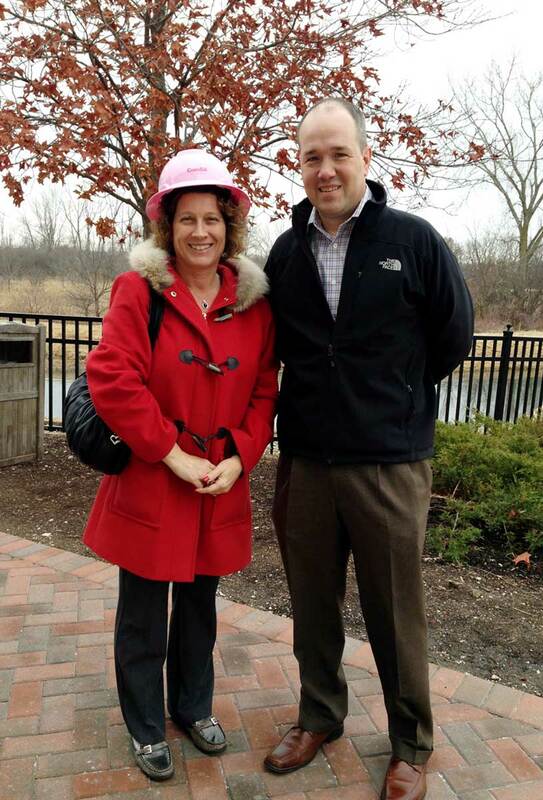 Wearing my pink hard-hat, courtesy of Darren Boundy and ComEd. My day continued on to a lunch meeting at Smokin’ T’s with our municipal representative from Com Ed, Darren Boundy. I was pleasantly surprised to learn that Darren and his family live right here in Long Grove, and that he grew up in Central Illinois in a farming town not far from my own hometown. After discussing ways in which our two agencies can work even more efficiently together, Darren had one more surprise for me–a pink hard hat! Worn by the Com Ed crews in October, these hats showed support and solidarity with all those affected by breast cancer. A meaningful memento, to be sure. To round out the day, I had the honor of presiding over a special Village Board meeting that afternoon, at Reed-Turner Nature Center. Eight students from the University of Illinois drove up from Champaign to give a final presentation on a semester-long project. Some background on this….Sam Quinn, a resident who is a Senior at U of I contacted me over the summer with an idea. He is a member of Illinois Business Consulting (IBC), a student consulting organization which undertakes projects for Fortune 500 companies, middle market, and non-profit clients. Sam wanted to know if he could do something to help revitalize our historic downtown, and if the Village would be willing to participate in a project with his student organization to explore some ways to do this. During the Fall semester, a series of meetings and weekly conference calls resulted in an area-wide survey. An analysis of the results was done to understand the market demand and potential, with final recommendations to the Village on actions to increase our business district appeal. Working with these students was a joy. But more importantly, it gives me hope. Not just for the future of our downtown shops & restaurants, which of course I want to see flourish. But for our community. Because if young adults like Sam have enough passion and concern about our Village that they are willing to get involved, in whichever way they can, then how can we not be optimistic about the years to come?